Most everyone is happy about the arrival of fall after a long hot summer. While welcomed, it also adds some more responsibilities around the house. It is not a favorite task for many, but cleaning your gutters is one of the fall maintenance tasks that makes a big difference when caring for your home. Since leaves will be falling and more debris will be piling up, this is a perfect time to clean your gutters before winter. Here are four tips on how to clean your gutters this fall. First, gather all the supplies that will make cleaning the gutters easier. Begin by making sure you have a pair of heavy-duty gloves to keep your hands protected when you’re reaching inside to pull out debris. You’ll also need a bucket to place the leaves or other items you are removing from your gutters. Secure a safe ladder and a pair of nonslip boots, and you’re ready to get to work. Don’t forget to have someone else at the house to assist you; its never a good idea to climb a ladder with no one else home. Knowing how to clean your gutters requires more than simply taking leaves and pine needles out of them. Many times, you’ll have stuck on dirt or pieces of leaves or debris that won’t come out easily. Using a high pressured hose to remove stubborn dirt or blockages is a must when you clean your gutters. This is also a good way to discover if you have any leaks so you can make any needed repairs before winter. Also, your gutters will be left looking like new when you have taken the extra step to flush them thoroughly with water. As mentioned earlier, climbing up high on a ladder can be dangerous. Position the ladder on solid ground at a 75-degree angle from your house. This will keep it from tipping over. Don’t attempt to carry too many supplies at once and have someone else around to help you. Knowing how to clean your gutters safely is important as you begin this task. Don’t Know How To Clean Your Gutters Effectively? 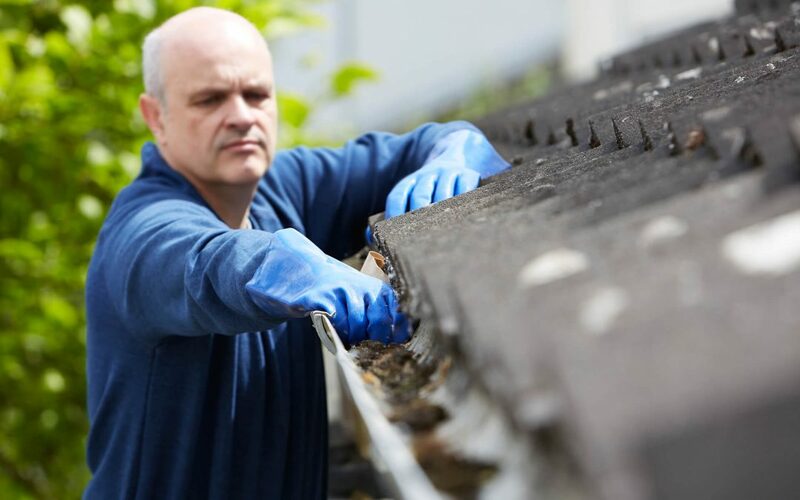 Some homeowners may not want to attempt cleaning gutters on their own because of the potential risks involved. If you feel cleaning your gutters is too difficult, call a professional gutter cleaning company to complete this task for you. Choosing a reputable gutter cleaning company can save you the stress of tackling this chore on your own. Knowing how to clean your gutters is an important task as the fall season moves along. As a homeowner, keeping your gutters clean will save you money on potential water damage to your roof, siding, and foundation. Olympic Shield Home Inspections serves Western Washington with home inspection services. Contact us to schedule an appointment.